The original full-featured hand replayer. PokerXFactor.com was built around this unique piece of software that allows you to see your hands replayed graphically and analyze tournaments to examine your play. There are a lot of hand history replayers out there these days, but the one offered by PokerXFactor is the original and still considered by many to be the best. Upload your hand histories and then review single pots, entire tournaments, or cash game sessions. The PXF Replayer is also a great way to review your own play. You can see your hands throughout the course of a tournament and watch them at whatever speed you choose. You can even pause the action and the replayer will give you the odds or you can attach notes to your opponents for later use. 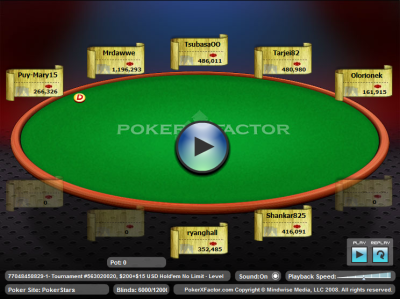 Many players also use the replayer to share hands in forums and blog posts. The hands are stored online and are available from any computer.